OOAK is Australian Distributor for Newgy - the #1 selling robot worldwide! Newgy robots offer many unique benefits, what other robots can claim to provide all the following? Newgy have been making robots for 20+ years, and have an impeccable reputation for robots that are both robust and easy to use! Virtually no maintenance, and piece of mind that if you do need to replace parts in future, Newgy will still be around to supply you and offer support. A comprehensive manual in proper English, with detailed diagrams and pictures, to help in setting up and maintenance! Huge range of accessories, making the robot more fun and helps to get more out of your robot. Pong-Master game makes it even more fun for kids, and helps develop their coordination and reflexes! Starting at under $300 for the very capable Robo Pong 540, it's affordable for everyone! Feature rich - enough for just about everyone! Quick and easy to setup or pack - no tools required! These are more than enough features for just about anyone, but even if there are some small features that our robots cannot provide, weigh up all the other benefits that Newgy robots offer, and choosing a Newgy becomes a pretty easy choice! According to studies, most people only end up using the basic features of a robot, so if another robot offers an advanced feature that Newgy does not offer, is it worth giving up all the other advantages that Newgy offers just to get that one features? Only from an authorised distributor you get an Australian power supply and plugs (Newgy will only supply these to the authorised distributors). An Australian warrantee and expert advice and support. The Australian warrantee will only apply for customers that have bought through an Authorised Australian distributor. Buying from the Authorised distributor ensures you get a genuine and latest model, and not an old stock. Our robots are in stock in Australia and have already been cleared through customs, so no paperwork, hassles or fees for you. Our prices include GST, which you might be able to claim if purchased for a business. To find out more details about the different models, browse our Newgy Robot Range here in our shop, and you should find all the details in the descriptions. A brief description of the major differences and who they're suitable for is given below. If you need more details, please don't hesitate to Contact Us, and we'll be happy to answer any further questions. The Robot-Pong 540 may be the entry model robot for the Newgy range, but it is a highly capable robot offer a wide range of spins and speeds, and a large ball container. The light weight yet sturdy construction makes it highly portable, and easy to take with you wherever you go! This is easily the best value robot, as it offers the full range of spins, and you can still vary the spin/speed and repetition rate! It allows you to practice your full range of strokes and fine-tune them. This robot is the next step up and is great for intermediate and tournament level players. 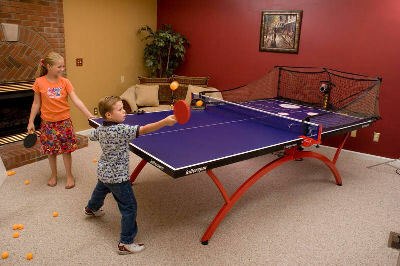 Includes all features of Robo-Pong 540, plus oscillation and more powerful speed/frequency controls. Bucket Extender expands ball capacity for longer continuous play. For players that want to add footwork routines to their practice, or make the excercise a bit more vigorous, the extra oscillation made (head moves from side to side) is a feature well worth it! I don’t think there’s ANY programmable robot on the market that comes even close to this price! Revolutionary digital controls mean easy, exact regulation of ball speed, wait time, and landing spot. Normal Mode gives you simple manual control over each function. In Drill Mode, run any of the 64 drills stored on the controller. Use PC Mode to create and save drills using a simple interface, then run those drills direct from your PC. Setup Mode lets you calibrate motors to a set standard and select your desired language. Intelligent design allows selection of favored hand so drills run correctly for either right-handers or left-handers. Or tell your robot to throw balls for 5 minutes, and it will automatically calculate how many balls will be thrown in that time. Robo-Pong 2040 – Recycles balls! The Robo-Pong 2040 robot can do everything Robo-Pong 1040 does and more. Recycling Net captures your returns and recycles the balls for non-stop action! All the balls hit anywhere in the recycling net are fed back into the robot. 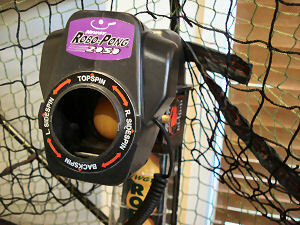 Plug in optional Pong-Master for a fun target game to hone your accuracy and consistency or use it as a timer for your drills. This has always been the most popular of the Newgy range, although the 2 new digital robots (1050 & 2050) might take over this spot! Robo-Pong 2050 – Programmable + Recycles balls! This the top of the range model, for truly serious players who demand the best! The 2050 model includes all the digital and programmable abilities of the 1050, but also offer the Recycling Net system for non-stop action! In case you were considering an Ipong robot, check out the comparison of Ipong vs Newgy 540 here.